BLOOD PUNCH follows main characters Milton and Skyler who are both in a drug rehab clinic. Skyler is very honest on her reasons of being at the clinic and announces that she is looking for a cook to make some drugs which will be worth alot of money. Soon Skyler and Milton are busted out of the clinic by Skyler's boyfriend Russell who is the guy with the drugs. They all go to a secluded cabin to make the drugs, but once the drugs are made Russell turns on them and kills Milton. This is where the film takes a turn as Milton wakes up the next day and has to make the drugs again. This happens several times, but once Milton realises what is happening he kills Russell. Yet again the day resets, after some research at the cabin Milton discovers that this has happened to people before on this land. The cabin is built on land where a bloody Native American war took place and ever since then if blood is spilt on the land the day must repeat until there is only one survivor. Things aren't simple though though as Milton has fallen in love with Skyler and can't simply just kill her and Russell and walk away. Ultimately though only one person can leave the cabin but who will it be? The psychotic Russell who isn't as dumb as he first appears, the love struck Milton or the devious Skyler? Well written and tightly directed this is one of those films that comes along every now and again that you can't help but fall in love with. It has everything you can wish for, a great storyline, brilliant characters, comedy and for those who want blood there is plenty to find here. The casting is perfect and I can't see anybody else playing these characters so well. 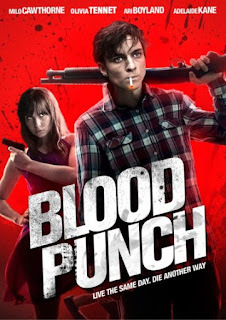 It should be mentioned that the people behind this movie had previously worked on things like THE TIGGER MOVIE and THE PENGUINS OF MADAGASCAR, but BLOOD PUNCH shows that you shouldn't pigeon hole creative people to one genre and here they certainly burst out of the children's entertainment bubble. BLOOD PUNCH is a brilliant supernatural thriller that will be easy to compare to GROUNDHOG DAY on steroids.